Many cash reload products are hitting the market and Green Dot MoneyPak is one of them. Basically, you can reload your prepaid debit card or add money to your PayPal with the help of MoneyPak without going through your bank account. With the help of MoneyPak and similar cash reload products, customers can save themselves from making same-day payments. It is different from a Green Dot debit card which has a link to its own bank account is used for making payments, similar to any other card. When it comes to adding money to your Green Dot prepaid card, MoneyPak comes in. • Easy, Quick, and Convenient – There are more than 50,000 locations where you can get a MoneyPak. Most local retailers offer this card and there is no requirement to fill any forms or stand in lines at the customer service desk to get this card. Your personal information is not required at the store and instant transfer occurs after reload, allowing you to make use of your money. It costs less than $4.95. • Reloading Prepaid Cards – A list of partners is available on MoneyPak.com and most prepaid cards are on that list. 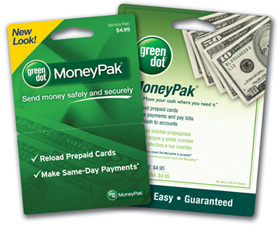 The reload can be performed by visiting www.MoneyPak.com or by calling 1-800-GREENDOT from your phone. There might be some restrictions with reloading and they vary, depending on the prepaid card provider. Reloading can be done 24×7 with no time restrictions. In order to check MoneyPak balance, a number is provided on the back which can be called for the same. • Making Same Day Payments – Other same day transmitter services for payments cost about $8 – $13. On the other hand, MoneyPak can be used for making these same day payments with $5 and virtually no hidden costs. • Adding Money to PayPal – Adding money to PayPal from traditional sources involves bank charges and interest payments. However, MoneyPak doesn’t involve those payments and can be a quick way to adding money to your PayPal account. Before using MoneyPak, you will have to provide your details like name, DOB, address, SSN et al so that your identity can be verified by Green Dot. Earlier, these details were not necessary but PayPal has recently added this measure to improve security. A limit of $4,000 is applicable on the money you add to PayPal via MoneyPak. For using PayPal services of MoneyPak, minimum age is 18. • Making Cash Deposits – Cash deposits can also be made using MoneyPak after purchasing the card from a retailer. It can be done through their website or via phone. • Reloads Are Not Unlimited – There are some limits to the amount and number of reloads allowed on your MoneyPak. 4 daily reloads or $1,500 are allowed; 7 weekly reloads or $3,500 are allowed; and 20 monthly reloads or $5,000 are allowed. These limits can be increased or decreased at any time by MoneyPak, so you should check their policy updates regularly. • Refund of MoneyPak – You can request a refund only on MoneyPak and it will take a week or so for the same. Refund status can be checked on their website. However, sometimes, an automatic refund is initiated when your personal details could not be satisfactorily confirmed using the national database. • Losing MoneyPak – MoneyPak is basically like cash. If you lose your wallet, you lose your cash. In the same way, if you lose your MoneyPak, it’s gone. There is no way for Green Dot to help you in its recovery and trace it. • MoneyPak Frauds – Like most credit and debit cards, MoneyPak is not safe from frauds either. FBI Internet scams, romance scams, impostor scams, grant fraud scams, lottery scams, online sale and auction scams, job scams and advance loan payment scams are some frauds you should stay away from. The website of MoneyPak offers 7 tips to protect you from a fraud. Overall, MoneyPak allows you to tackle security vulnerabilities while making online payments. You don’t have to use your credit card or bank account. You can simply use MoneyPak.